The role of enterprise architecture (EA) has never been more important, and never have IT departments had to be as responsive to the businesses they support as now. So how are enterprise architects perceived in a daunting economic recession, as saviors or door stops? During a recent panel discussion, at The Open Group's 22nd annual Enterprise Architecture Practitioner's Conference in London, England, this question was probed. "Resisting Short-term Thinking: Rationalizing Investments in Enterprise Architecture During a Recession" uncovered surprising insights into how enterprise architects can help businesses and IT departments, especially during periods of turmoil. The challenge for EA is to be able to balance the long-term goals against the pressing short-term needs of the business. There are intense commercial pressures right now to reduce costs at a time when capital expenditure is severely constrained. Operational efficiency has become an imperative, but agility and speed to market are equally as important. How to reconcile the short-term needs with the long-term goals? Can they be done simultaneously? Can the architects bridge the two? 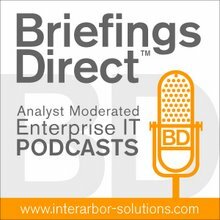 To better understand how IT and business can better support each other, with architects as the leads, please listen or read as noted IT journalist and analyst Kevin White, contributing editor to Computer Business Review in the UK, as he moderates the panel. Guests include Henry Peyret, principal analyst at Forrester Research; Phil Pavitt, the group CIO for Transport for London; Thomas Obitz, a principal architect at Infosys; Mike Turner, enterprise architect at Capgemini, and Terry Blevins, a senior principal information systems engineer at MITRE and Open Group Customer Council Board member. White: In a downturn, there is a natural tendency to accentuate the tactical, short-term initiatives, and EA arguably is inherently long-term. This is a crucial issue of how you balance that long-term architectural goal against the short-term needs of the business. Pavitt: ... Suddenly, I can see where EA actually become a critical part. Taking our standards and designs, because they're common across the business, becomes a very efficient way to operate and to run. So my role as CIO, it is to demonstrate to the business that we can add value, and that value is primarily helping them with their business needs, as it ever was, but now helping them in a way that's cost-effective and frees up cash on other things. In this last year, the project meetings I've been to, where the respective project director says, "And that will be $X million over 12 years, etc.," all those conversations have gone. It's much shorter values over much shorter times. The day of the big program is dead. The day of the big outsource is dead. The understanding of our architectural process that's going to apply to that is a critical interpretation that CIO and his office will do for the business. Otherwise, they will go for "short-termism." Obitz: EA clearly becomes a tool for strategic business transformation. ... Enterprise architects are changing their positioning, and that means that the value that the organizations are expecting out of them is changing, and also, the way they are talking about value and how they are proving value. ... What is EA good for? It's an approach for solving the problems of an organization. As we say, the problems are here and now. ... You need to identify architectural approaches to solve them. And, you need to start gradual change right now. So, yes, you are capable of demonstrating a long-term path, but you are creating value in the short-term. Basically, as enterprise architects what we need to change in our overall approach is that we need to go away completely from this architectural approach, which is about, "We build a big picture of how we could imagine things work and then implement that over a long time," to "What's an approach that's issue-driven." We need to identify where the issues of the organizations are today, identify what needs to change, and then consolidate that into the big picture. [Architects] need to understand how decisions are made at the top level, and they need to have an approach of presenting what he's doing and what he suggests in a way that is understandable and traceable for the most senior decision makers in the organization. We're basically moving toward management consulting. White: EA has to make an impact, a business impact. What other ways can we accelerate fast impact programs, where there is a necessary focus on operational efficiency, productivity, and cost reduction? Turner: One of the real opportunity areas that EA is uniquely placed to deal with is working across silos. IT could be one of those silos, but there's any number of other silos within the business, across HR, finance, and different parts of operations. EA is a fantastic tool to be able to consult a wide variety of stakeholders about a particular market change, get a consensus viewpoint about that, and really have to define the responses across the whole organization. ... The worst thing you could do in any crisis situation is to allow fragmentation and different parts of the business to go and try different strategies. You may be cutting cost in one area and trying to increase value in a different area. You end up conflicting with each other and ultimately creating more tension and having a destructive impact on the business. Peyret: Currently, there is a trend to rationalize everywhere, to try to decrease the cost. Obviously, it's the right time to score applications and be able to say, "Okay, I would like to cancel and kill some of those systems that are expensive, that cost a lot, are not maintainable, are not sustainable for the long-term, and many other things like that." At the same time, I also see some industries in which IT is becoming more important, and where some of the business will be done with IT involvement. ... I see some innovation, and one of the roles obviously of EA is to help businesses bring that innovation in at a right time. We have seen some of those mistakes in the past. Pavitt: ... I do agree with the sentiment that's been expressed here: get to know your customers. I've been frustrated with my own EA team time and time again. They are politically naive. As a CIO, I meant to be one of the sharpest political operators in my business, not because my business is particularly more political than anybody else's, but I'm the one who operates horizontally. I'm the one who can be used as an excuse for every other department's failure, whether I've caused it or not. I'm the one in my company who is measured 1.7 million times every hour when someone presses the Enter button. We're the only department that's measured that often in real time of any other team in the company. Recognizing value in terms of what the customer, in our case the actual user, wants is critical. EA should be much more physical, politically savvy, and much closer to their customers. This is not a visit once a month. Most of my EAs will end up in the business in the next six months, not in IT. I'll force them to be in the business, because I've asked them to do it nicely. Then they'll judge even more the value they can contribute. Of course, if the business then doesn't value them, they would do something about it. Obitz: ... Enterprise architects need to put rigor into how they justify and explain the value of what they are doing. ... Enterprise architects ... need to take a different approach. The typical IT architect approach, "I do this because I think this is best practice," is something that nobody outside a team has ever accepted as a measure that is presentable. If they are very rigorous and are collecting data about what they're doing, collecting data about the business value they're influencing and enabling for the whole organization, and if they are collecting data on how they're accepted and involved with the work of the remaining organization, then 85 percent are capable of justifying the work of the EA team. You need to put in this work. It's extra work, admin work, and it's boring. Enterprise architects don't want to do that. They need to talk about it. If an EA team doesn't report metrics on a regular basis, they're not recognized as a value source in the organization.